Browse to the dataset file (or group of files) that you want to add. FME can usually determine the format from the file extension, and will automatically populate the Format field. These fields will already be filled in if you dragged a file directly onto the Workbench window. If the Parameters button is enabled (and this depends on the format you choose), you can specify more detailed information about the reader data. Parameters are optional: if you don't edit them, FME will use default values. For detailed help, press the Help button or F1 key when you open a parameter box. For formats that know their coordinate system, the Coordinate System field in the Source Dataset dialog will display Read from source and FME will read the coordinate system from the source dataset. For other formats, the field will display Unknown. You do not have to edit these defaults. Clicking the browse button beside this field will display the Coordinate System Gallery, which contains all the coordinate systems that FME supports. Select the format to which the data will be translated, and a name for the output file. To output data to a zip file, click the zip output icon . For formats that know their coordinate system, the Coordinate System field in the Source Dataset dialog will display Same as source and FME will read the coordinate system from the source dataset. For most other input sources, the field will display <not set>, which means that FME will use default values. You can accept the defaults in most cases. Clicking the browse button beside this field will display the Coordinate System Gallery, which contains all the coordinate systems that FME supports. If you want to change the writer coordinate system, see Reprojecting Data. If you are writing to a database format, you can choose to import feature types with numerous attributes and properties from an existing writer. This eliminates this extra step after you create the workspace. If, for example, you want to write to an existing Oracle table, you can check Import Feature Type definitions here and import the destination feature type with all of its attributes and data types defined exactly as they are in the existing Oracle table. You can set workflow options before you create the workspace. Static Schema is the default workflow, and is suitable for most workspaces. The schema is read from the source data and replicated on the workspace. Each reader feature type will be connected to its corresponding writer feature type. Dynamic Schema breaks the dependence on the source and destination schema. One merged feature type will be connected to one writer feature type that is configured for dynamic operation. The schema is not replicated on the workspace; therefore, if the source data changes, you will not have to update the workspace – FME will do this automatically. Click OK. The translation log displays information related to workspace generation. Note that if you closed the translation log through the View > Windows menu, you can also see a subset of logging information in Workbench’s status bar. 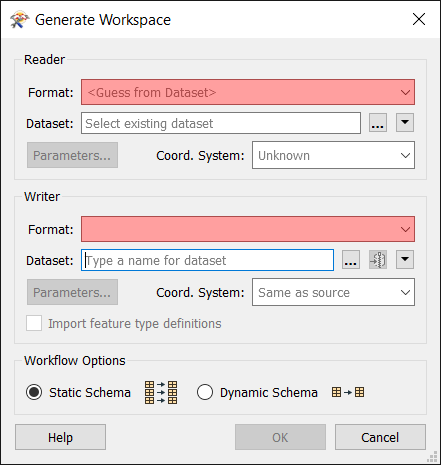 Once you have created the initial workspace and it is displayed in the graphical view, you can either save the file in its current form, or adjust the data flows by adding transformers or new attributes.